The atomiser which is installed on an Underport Oil Burner, comprises a choke (1) , jet (2), seal (3) and a jet cap (4). 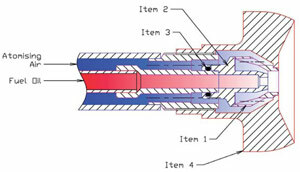 Fuel is fed under pressure through the fuel tube bore. The atomising medium is fed under pressure through the air tube bore and around the atomiser jet , through the choke , where it mixes with the fuel which it atomises to a fine spray. The spray passes out through the choke . The atomising medium is directed round the choke  in the above described manner in order to keep the atomiser cool and thereby increase its useful life. Oil Pressure @ max flow: 0.6 Bar g.